Lumineers™ | Charles E. Boren D.D.S.,P.C. Are you looking for a way to achieve that megawatt smile, but are fearful of the traditional porcelain veneer process? LUMINEERS are a great alternative to traditional porcelain veneers, especially for people who have a fear of the dentist or just don't want their teeth drilled on. These veneers provide a way to permanently whiten and align teeth and repair chipped teeth and close spaces without the drilling of sensitive tooth structure. Im most cases numbness shots are not needed. LUMINEERS are ultra-thin veneers made from CERINATE porcelain. The thickness is comparable to that of a contact lens. - Conviently applied in as few as two visits. - Temporary veneers are unnecessary. 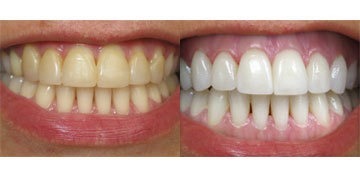 - They are expected to last as long as traditional veneers. - Reversible if no tooth reduction was necessary.